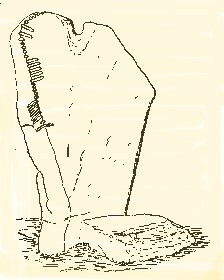 This is a multiple bullán -- a large flat stone with several bowl-like man-made depressions dated to medieval or early Christian or pre-Christian times. Bulláns are usually found in low, wet land. Archaeologists theorize about their use: communal grain or iron ore grinding, ritual herb or grain grinding, oil lamps. They have been and still are used as cursing or prayer stones. An unjustified curse will rebound on the curser. The Big Wind of 1838 is said to have been caused by a woman using cursing stones. In 1884, Tory Islanders turned the stones against the British gunboat the Wasp, which was bringing police and troops to the island to collect taxes. The boat sank with loss of life. 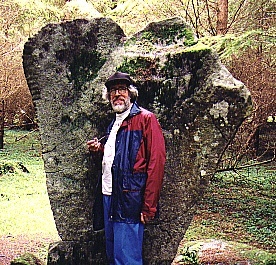 The harp-shaped Knickeen Ogam Stone in a forestry plantation in the Glen of Imaal. The inscription reads "MAQI NILI - The Son of Nili". We spend most of our time rambling round Kilranelagh Hill, where we see the following. 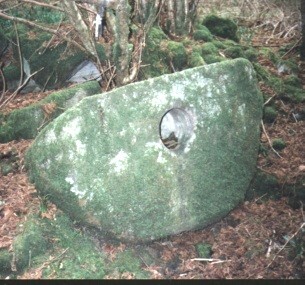 Bronze Age (c. 2000 BC); known locally as the "Griddle Stones"
Large white quartz boulders, a landmark in the story "Fingal Rónáin" and other early legendary history stories. 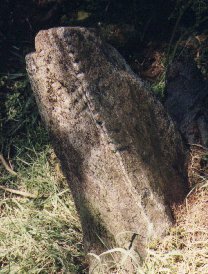 There are two explanations for the Irish name, cloch na gceann ("stone of the head"). One is that Cummascach, son of the high king Aed Ainmire, was decapitated here in the Bórama saga. The other comes from a local practice of putting one's head in the hole to cure a headache. Coins, candle stubs, holy medals and pictures have been left in the hole in thanksgiving for a cure. It works, according to one woman who I watched try it. But don't put your head in the hole if you don't have a headache. I saw the opposite of a cure happen, too. It is a local custom to carry a coffin between the orthostats of this ruined prehistoric tomb, so that the deceased will go straight to heaven. 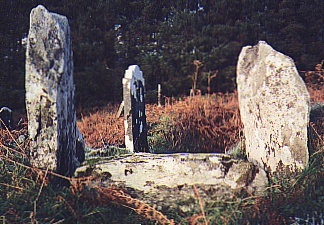 Aedh Ainmire -- sixth-century High King -- was buried in this cemetery, after losing the Battle of Dún Bolg in the Bórama saga. 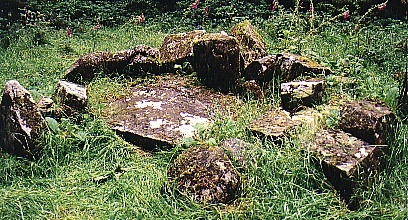 The cemetery is next to Kilranelagh (14th-century ruined) Church, thought to be St Mary de Hogges nunnery. 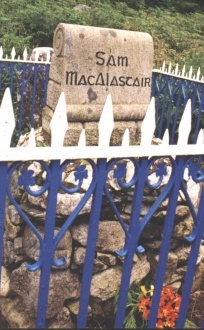 In February 1799, Sam Macalastair gave his life to save Michael Dwyer, hero of the 1798 Rebellion and guerrilla leader in South Wicklow for 5 years after the Rebellion ended, at the siege of Derrymuck in the Glen of Imáil. On the 200th aniversary of this incident, local people placed flowers on the well-tended grave, which is surrounded by symbolic pikeheads. Dwyer's and Macalastair's names appear on this commemoration stone in Glenmalure, one of Dwyer's bases of operation: "In remembrance of those who fought bravely for Freedom and Justice from these mountains." The great Leinster saga The Bórama (The Cattle Tribute) tells how the High King imposed a massive tribute on Leinster in the first century, and how following kings tried to enforce it -- with varying degrees of success -- for 600 years, until Saint Mo Ling ended it with a verbal trick. The medieval historical fiction "Fingal Rónáin" (The Kin-slaying of Rónán) is a soap opera of lust, blood and violence.